The Rock Monster Guardian seems to have mutated. The one that threatens Sue in this issue is brown in color, not blue as in the very first Fantastic Four issue in 1961. This one is also shaped a little different as well. However, he still appears to be the same monster. 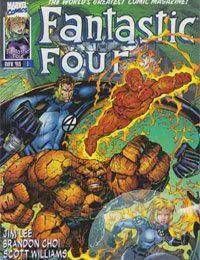 Fantastic Four: ¡Isla De La Muerte! Hero Initiative: Mike Wieringo Book: What if THIS Was the Fantastic Four?